The Church of the Holy Spirit in Naples hosts the mulstisensorial experience for art lovers: Klimt Experience,till Sunday February 3rd 2019. 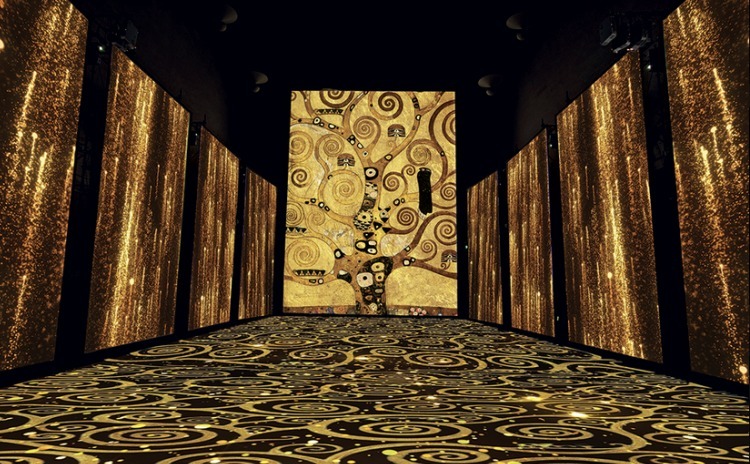 In the “experience room” around 700 images of Klimt artworks are projected that fill the ceiling, walls and floor, involving the visitor in a 360° experience through the works of the artist. 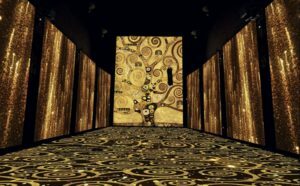 Klimt Experience is an unusual exhibition that allows to observe art in a different way, by using the potentialities of new technologies. Klimt Experience – Milan ItalyA visual show realized thanks to Matrix X-Dimension System, projected exclusively for this video installation, and that use a huge equipment of laser projectors, which are able to transmit on the surfaces of the installation more than 40 milion pixel, guaranteeing a higher definition than the Full Hd one. It is possible also to admire photos of the time about the artist’s life and 3D reconstructions of Vienna at the beginning of 1900’s that help to better understand the author’s poetry influenced by the social and cultural context in which he lived. As background music a soundtrack with music by Strauss, Mozart, Wagner, Lehár, Beethoven, Bach, Orff and Webern, who influenced the artist.